The exhibition terra mineralia, the new highlight of Freiberg, gained a fascinating location for its exposition at the lavishly refurbished Castle Freudenstein. The Renaissance castle, built in 1577 on the grounds of the original fortress to protect Freiberg and the silver mines, also offers an imposing setting for the working and archiving rooms of Freiberg’s mining archive. Around 1168, the first silver deposit was found in the region which should later become Freiberg. After this finding the population as well as the importance of this area grew steadily. In order to protect the mines and the population Margrave Otto of Wettin (the Rich) decided to build a representative residential and administrative centre for the Wettin Lords and so the first castle was built between 1175 and 1177. 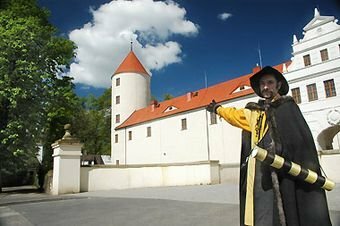 In 1505 Duke Henry the Pious became sovereign of the Freiberg region and proclaimed Freiberg's castle (which is firstly mentioned as Castle Freudenstein in the records in 1525) as his main residence. During his reign, Henry the Pious made Lutheranism the state religion of the Duchy of Saxony and declared Freiberg's dome to his burial place. The declaration of Freiberg's dome as burial place for the Saxon electors represents an essential milestone in Freiberg's history as the importance of Freiberg and the Castle Freudenstein was significantly increased by this declaration. Hence, elector Augustus decided to rebuild to castle completely as a Renaissance castle in order to represent its new status. In 1697 the dome of Freiberg lost his importance as burial place for the Saxon electors as Frederick Augustus I (Augustus the Strong) converted to the Catholic Church. As a result also the Castle Freudenstein lost its importance for the Saxon rulers. Less money was spent on maintenance of the building and so the castle started to fall into ruin. The last prominent visitor was Czar Peter I of Russia who visited the castle in 1711 and described it as dilapidated. 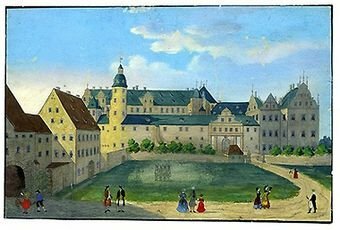 When the last battle of the Seven Years' War was fought near Freiberg, the castle was firstly used as prison. In 1784, the castle ruin was taken over by military forces and was comprehensively reconstructed. During these reconstruction works the interior was destroyed completely. In order meet the requirements as a corn storage unit, additional storeys were embed into the castle which are still partly visible today. In 1813, the castle was used as a military hospital by the French groups during World War I. In the nineteen-twenties and thirties the castle was used as storage unit of a supermarket chain. Additionally, the castle harboured a coffee-roasting plant. Between 1939 and 1945 the castle was used by the German Armed Forces and the SS as quarters and detention centre for prisoners of war. Between 1957 and 1978 the castle was used as a granary again. The district and town administration decided to give the castle a new function as a "Site of social encounter". One part of this plan comprised also the reconstruction of the castle to its former Renaissance appearance. However, the political break-down of the GDR put an end to this project. The restaurant which was opened in 1986 closed its gates in 1991 as the end of the project became official. After that, the castle was not inhabited or used for more than one decade. In 2003 the city council of Freiberg decided together with the Saxon state government that the TU Bergakademie Freiberg may use the castle together with the Saxon Archives of Mining. Based on this decision, the reconstruction of the castle began in the following year and was completed in October 2008 with the opening of terra mineralia. Malachite is a copper mineral - the deep green colour of malachite also comes from this mineral. In terra mineralia’s treasure chamber, a particularly large and famous piece of malachite can be seen. If you look very carefully, you’ll see that it grew from the top downwards, like a stalactite in a cave. This also accounts for the unusual form of this piece of malachite. 51 x 38 cm; Photo: Jörg Wittig, Dresden.